The Motorola Xoom sure has a lot of whizbang stuff inside: Crazy dual-core processors! Nvidia graphics! HD camcorder! 1GB RAM! Front camera! 3G that's somehow magically upgradeable to 4G! But, uh, it's eight hundred dollars. And it gets worse. To activate WiFi functionality on this device, a minimum of one month data subscription is required. Like Engadget, we can't figure out any other way to translate that besides the Xoom's Wi-Fi is locked down until you activate a data subscription with Verizon. They're requiring you to buy at least one month of data service to a basic feature of the hardware? What. The. Balls. The pricing is horribly wrong for a couple of reasons on top of that. One, there isn't a cheaper option. While the most expensive iPad with 3G and 64GB of storage was $830, people still had the option to purchase a bunch of cheaper models, down to $500. 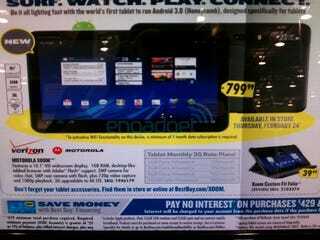 In other words, the iPad cost as much as a netbook; the Xoom costs as much as a laptop. And while the Xoom's guts are steelier than the iPad's right now—justifying the price difference—that probably won't be the case in a just a couple of months, when a new iPad's likely to show up. Historically, Apple's next-generation gear tends to have sparkly new specs while maintaining the same pricepoints. Meaning the Xoom's $800 price tag isn't going to look any better, so hopefully Moto's promised Wi-Fi model is coming sooner, not later. Don't get me wrong, the reason the pricing seems so gross is that we've been waiting for nearly a year for some real iPad competiton. And at $800, with required data service, I think Moto will mostly be selling them to diehard nerds.